It Pi day! Hip hip hooray! It is becoming a tradition in my household to play around with different pie recipes for this oh so special day. This last weekend I decided to make savory meat hand pies one day and the next day I used the same idea to make an Irish Meat and Potato pot pie. Yum! I deeply apologize for not having recipes to share with you for those yummies, BUT I felt like there were places I could definitely improve upon the flavor and texture. So anyways, I basically cooked up a mixture of ground beef, onions, carrots, diced potatoes, and made a gravy with a splash of Guinness and beef broth, bake that in a premade refrigerated pie crust and you have Irish Pot Pie! *I accept responsibility for that run on sentence. * Not too difficult and tasty! When I am happy with the recipe I will share it with you. Sound good? Good. On the other side of the pie spectrum you can celebrate Pi day with pizza! Sometimes referred to as pie, pizza is a perfectly acceptable meal to celebrate this righteously mathematical day! What’s happening? Social Media, Life, and Adventures! I can’t believe fall is finally here! That means Halloween is tomorrow, Thanksgiving is next week, and Santa Claus is already coming down the chimney. Here is a fun little tidbit, have you noticed the fun little social media buttons to the right? -> that way! Unless you’re viewing this on a mobile device, in which case you may need to scroll down. Modest Bites now has its very own Facebook and Instagram! Do you know how much it means to me that you all take your time to read my little dribbles and recipe scribbles? You have no idea how much! Please like and share my pages with your friends. You will see post updates and photos of food and life that I may not share here on the blog. Also, my son is a toddler sized model. I can’t get over his curly blond hair and those blue eyes are instant mommy melters! His hobbies include pretending everything is a gun, making animal noises, making messes, and refusing to eat healthy meals prepared with love. Despite the difficulties of toddlerhood, I love this boy to the moon and back! In other news, my hubby has been working hard with his business partner to build a new business over this last year. It has consumed a lot of time but we continue to be optimistic. Welcome Elite Oil Technologies, check out the website! There is a live website that is being revamped slowly but surely to give visitors their best experience. Nano-oil fell into their lap the end of last year and it has taken quite a bit of time to get everything up and running but we’re seeing the light at the end of the tunnel. After a long road with website set backs, setting up an office, getting the inventory stocked, and biting our nails in anticipation I am ready to get the show on the road! When the site originally launched we cheered, but it quickly became apparent that there were many areas that could be improved upon and that is what is going on behind the scenes now. The good news, there is a working website where you can order products to your hearts content and we celebrated that fact with a soft opening party last weekend. Of course, I catered and enjoyed planning the party so much. We had a nice little get together, tons of food, and good company. My favorite thing of the whole day! Lemon cupcakes with blueberry buttercream and coffee cupcakes with mocha buttercream… oh heaven! I made these tiny little cupcake toppers to make them extra special. They were a bit time consuming but worth it! We had plenty of food! Better too much than too little. Veggie platter, cheese and crackers, mini cornbread bites, scrumptious little smokies, spritz cookies, brownies, and heavenly cupcakes. I ate a lot that day. And then we had leftovers and I ate a whole lot of those too. For the simplest way to fancy up the tables I grabbed pretty gold scrap book paper, a handful of clear bowls, and gold wrapped candy made a nice simple centerpiece. The balloons were a fun touch as well. We had plenty of options for drinks! I made a crazy simple and crazy good “sangria” with a bottle of mixed berry juice and a bottle of moscato. If I’m in charge of the food then I am going to make something I like. I know you’ll like it too! If you, or someone you know, is looking for a fantastic oil for any number of applications check out the website and try it out! We have heard from people using it on machinery, knives, guns, hair clippers, bicycles, and even a kitchen mixer! Good reviews all around. A lot of the mechanical mumbo-jumbo is over my head but the website has a lot of good information on it already if you’re interested in learning more. The title of this post is fitting for the delicious meal I pulled together this week. In no way, shape, or form is this a daily thing in our household but I was so proud of myself I decided to share it with you! Oh honey, oh baby look at that! Sorry for calling you honey… and baby… I hope you understand just how excited this picture makes me. Grilled foil-pack potatoes, spicy luscious bacon-wrapped jalapeno poppers, and barbecue burgers with bacon left me mmmmming and ahhhhing through the whole plate. Over the next few days I will share the recipes for these delicious dishes and I hope you will enjoy them just as much as I did! While living with a toddler I have found that I need to be creative when he decides he no longer wants to eat a certain type of food. One day, Sam will eat (insert name of food) like there is no tomorrow, the next day he throws it to the dog. I have been told that this is normal toddler behavior, but it sure can be annoying. In order to reduce waste I have been keeping a baggy in the freezer to make smoothies for him when I get enough fruit collected, throw a little spinach or kale into the mix and I feel pretty good about that healthy snack. I hope that you are familiar with the wonderful world of BLT sandwiches, if not, then you really should rectify that situation and eat a BLT immediately… like right now, I’m not kidding. I wish I had one myself to be honest. In an attempt to spice up life a little bit I decided to do a minor upgrade on the delicious classic and throw a simple horseradish mayo spread on my bread before piling it high with bacon, lettuce, tomato and avocado. Yes, I said avocado and boy is it delicious! Remember that roasted spaghetti squash I showed you how to make? Well, this is what I ended up doing with the cooked squash. Originally, I grabbed what I had available and threw it together as a simple dish to sneak more vegetables into Sam’s diet but as I was tasting it I decided I was going to enjoy this just as much, if not more, that he will. Toddlers are be such picky things aren’t they? One day Sam will eat anything and everything, the next day he turns up his nose at the exact same foods. From what I hear it doesn’t get any better! All I can do is push as many healthy foods at him as possible and hope some of it sticks. Thankfully, this seems to be something he enjoys. I am pleased with how this squash and kale casserole turned out and I love the fact that I can freeze it in little containers and pull it out for individual meals. Spring is here! Hallelujah! I could sing from happiness at the thought. The tree in our front yard is beginning to blooming and I love to see the beautiful pink flowers! Every year I try to pay attention to when the trees first bud and sprout leaves, half of the time I miss it and suddenly realize that everything is green. Does this happen to anybody else? Along with Spring we are also getting ready to celebrate Easter and that really marks the beginning of season for me. With warmer weather heading our way I am in the mood for something bright and delicious. I plan on making these lemon bars within the next few days and try to keep myself from eating the entire pan in one sitting. Happy St. Patrick’s Day! This is when many people get together and drink green beer and pull out their “Kiss Me I’m Irish” t-shirts. For me, St. Patrick’s day is an excuse to eat delicious heart warming Irish inspired foods and laugh when I get to pinch Mr. C for forgetting to wear green. This year I made a fantastic beef stew flavored with Guinness and completely full of tummy-filling goodness. I was so surprised and pleased by how flavorful the broth turned out to be! Normally, I scoop out my bowl focusing more on the fillers in the stew, not the broth. But this time I was scooping extra broth into my bowl just to have an excuse to sop it up with a piece of bread. 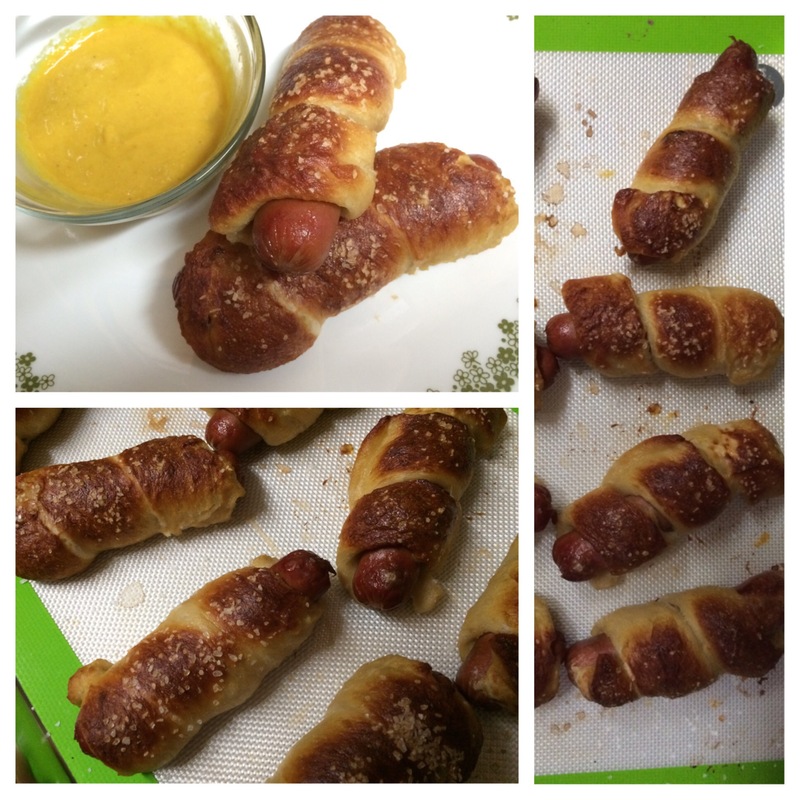 Guys, I actually made pretzel dogs last night! I am probably too proud of myself over that, but I don’t care- yay me! This was an experiment after seeing the idea in a magazine and I am pleased that they actually turned out. I won’t be sharing the recipe yet because I need to try and tweak it a bit before I take it public. But, I am feeling good about it so I wanted to share! While everybody else is stocking up on chips and pinning recipes for dips and hot wings, I am busy day-dreaming all of the possibilities of what I can do with my new heart shaped silicone mold! Would you hate me if I told you I have never watched a Superbowl? In high school I went to football games solely to talk about boys with my friends and drink hot chocolate. With Valentine’s Day in a week, I am more excited about heart shaped foods than I am football! For Mr. C and I, our Valentine’s day will be quiet and low-key; if you are very budget conscious like we are, your Valentine’s day may be very similar. We aren’t going out for an expensive dinner, but we still want to celebrate the day! With my heart shaped silicone mold the first thing to come to mind are adorable heart shaped cupcakes, but I am determined to show that there are loads of possibilities! Valentine’s Day 2016 Series: My goal for the next week is to experiment making heart shaped foods to inspire you for the upcoming holiday. Breakfast, lunch, dinner, and dessert – I can’t wait to explore the possibilities!